What is a Custom Rack / Custom Cabinet? Custom Racks and Cabinets are racks which require unique dimensions or usages. These "truly custom" applications require a full-service custom enclosure and sheet metal fabricator. We offer design assistance utilizing AutoCAD and CAD/Cam programming custom sheet metal fabricator and have helped customers in many industries including telecommunications, information technology, military and aerospace. If your requirements call for a unique height, width, depth, or a specialized application such as water or dust proofing, or a shock resistant rack, please complete our Rack Project Evaluation form or call us at 1-866-722-5776. 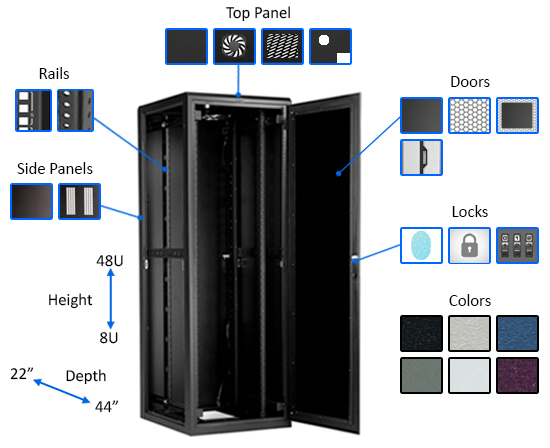 Server Racks Online has thousands of products on our website. Many of them can be "custom configured" to meet most application's requirements. Some applications require advanced rack cooling or power installations which require a system engineer to design and configure. For more details on how our expert engineers can design an advanced cooling or power infrastructure for you, please complete our Rack Project Evaluation form or call us at 1-866-722-5776.